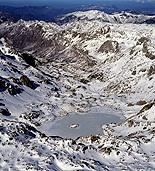 The Somiedo national park spans some 39,000 hectares in the Cantrabrian mountain range. 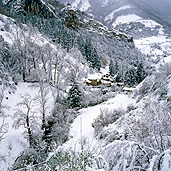 It was the first terrain to be declared as “Parque Natural” and “Reserva de la Biosfera” in Asturias, confirming its status as a unique natural setting. Woodland covers almost a quarter of the park's area, and the mountains remain the most prominent feature of its landscape. Half of the bear population inhabiting the entire Cantrabrian mountain range is to be found here, in addition to wolves, grouse, eagles and a multitude of other species, all of which have found their ideal habitat in the park. The sparse human population and its sustainable use of the park's natural resources over the centuries has given rise to its present-day status as a peerless natural enclave, one which I will do my utmost to show you, paying special attention to the influence of human inhabitation, without which the park would not be the same today. A series of hiking expeditions designed for approximately seven people, led by Antonio Vázquez. The objective is for the participant to be able to photograph the spectacular landscape and the flora and fauna found within. You will be supported at all times by the professional expertise of the tutor, as well as his extensive knowledge of the area. Excursions will start at 9am and last until approximately 6pm. Each day will close with a session involving appraisal and commentary of the photos taken. · Price per person: €1000, sharing double room (€100 single room supplement). · Price includes breakfast and picnic. · All-terrain vehicles for transport for initial part of routes. · Expertise and tuition by Antonio Vázquez at all times. · NOT INCLUDED: Flights and transfers to hotel. The subscription period closes one week prior to the course start date. 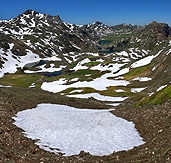 This section is intended to provide information about courses or workshops that will impart Antonio Vázquez in different National and Natural World Parks. For more information about more workshops at any time of year you can contact me.